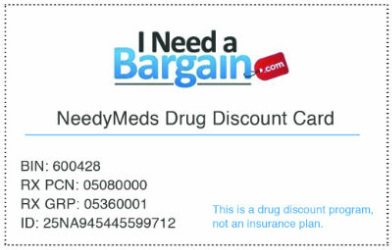 INeedaBargain.com presents a drug discount card offerred by NeedyMeds that can save users up to 80% off the price of prescription medications. The card may be used by those without insurance and by those who decide not to use their insurance — for example, if the drug is not covered under their plan, the copay or deductible is high, the cap has been reached, or if they are in the donut hole. The free NeedyMeds Drug Discount Card is accepted at over 62,000 pharmacies, including major chains such as Walmart, CVS, Walgreens, Rite Aid and at regional chains and local stores. There are no income, insurance or residency requirements, and no fees or registration process needed to use the card. One card can be shared with friends and family members, or they can print their own. The card is active immediately and never expires. The card can also be used for over-the-counter medications and medical supplies if written on a prescription blank, and pet prescription medicines purchased at a pharmacy. The card cannot be used to lower a copayment. This card is not an insurance program — it's a discount card. There may be no savings for certain drugs, including many inexpensive generics. Download a card HERE and print the page. For more questions regarding the drug discount card, visit FAQ at www.drugdiscountcardinfo.com or call toll free 1-888-602-2978.